This is a fun composition that relies on large AOE crowd control spells that isolate enemy movement followed up by massive damage from long range. This results in unavoidable damage or at least a large set of summoner spells blown. Meanwhile, if they don't have summoner spells available you can watch as Miss Fortune and Ziggs absolutely shred through their health. Miss Fortune [Marksman] - Miss Fortune in this composition will want to pick up Arcane Comet and max her E in lane. By combining her Make it Rain with Veigar's Event Horizon, enemy laners will be forced to stay in her damage for the full duration of the spell. Ziggs [Mid] - Ziggs in this team composition is a no-brainer, and targets that are sitting still are easy prey. You can also use your satchel charge to knock enemies into Veigar's stun if you choose. Veigar [Support] - Many people underestimate how useful Veigar can be in as a support. Against poke/sustain supports he certainly has some trouble, but against all-in melee supports he does extremely well as a counter engage or as a harasser. 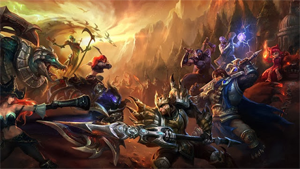 Jarvan IV [Jungler] - The classic wombo combo champion is back in the fray as a high damage engagement source and excellent isolationist as well. His armor reduction also works wonderfully to synergize with Miss Fortune's ultimate. Yorick [Top] - While Yorick's walls are a bit slow, it's really his ability to annihilate turrets, split-push, and front-line that you're looking for out of this guy. This team is very flexible when it comes to grouping up or split-pushing since with a good combo, they can 4v5 easily. Countering this team largely means keeping out of range of their crowd-control spells and being able to interrupt Miss Fortune when necessary. Xerath [Mid] - Fighting poke with poke is going to be largely a skill match-up, but you'll need your own mage since assassinating Ziggs will be difficult with Veigar as support. Gragas [Jungle] - Clearing out the enemy team to prevent their devastating combos is ideal and few do that job better than Gragas. As a plus, he can also interrupt Jarvan's E->Q combo using his Body Slam. Lissandra [Top] - Using her claw to bait out Veigar's stun is ideal. By not going for a melee top lane you can also avoid getting too close to the enemy's powerful crowd control spells. Blitzcrank [Support] - Similar to Gragas, use Blitzcrank to break up their team combos and hopefully pick up an easy kill on a key target. Jhin [Marksman] - One of the best compliments to both Blitzcrank and Xerath, Jhin cornerstones this counter comp via his long-distance engage and crowd-control spells.